Recently picked up Rainier Ballistics as a sponsor and got a load of 124gr RN plated bullets to try out in my Open Gun. Brought it out to the range today to test and I was very disappointed. They didn’t perform as expected but found out the problem later when I went home. 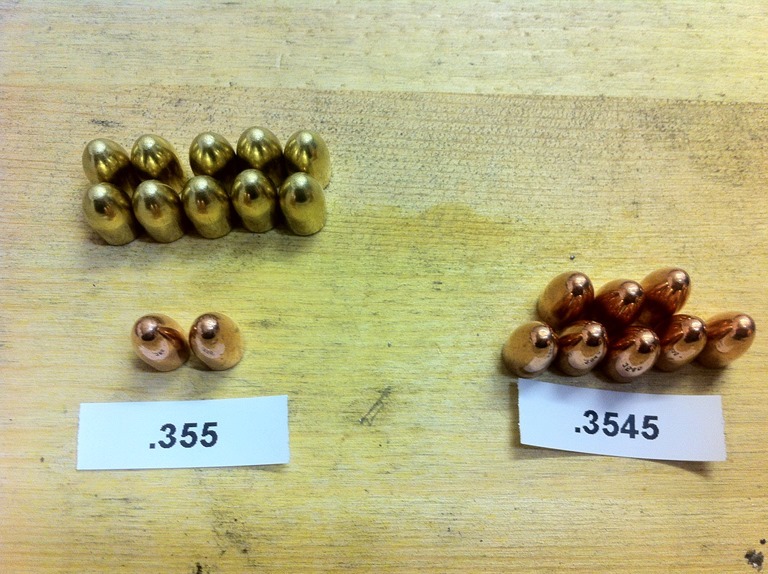 here’s the two groups of 5 shots that I made comparing Rainier 124gr RNs to Montana Gold 124gr CMJ Jacketed bullets. 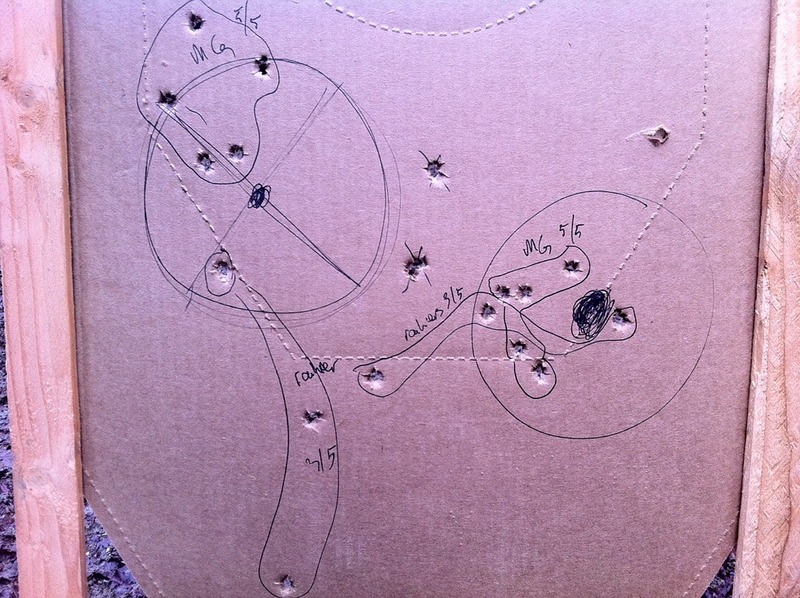 These are shot with 8.2gr Hodgdon HS-6, Winchester SRP, Various once fired brass at 20 yards. as you can see, the Montana Gold bullets group really nicely whereas the Rainier’s are all over the place, if they actually hit. I only managed to get 3 out of 5 shots on paper. I’ve also measured the sizes of the plated bullets vs jacketed and the MG Jacketed bullets (out of ten) come in at .355 consistently while Rainer’s come in mostly at .3545. I consulted my panel of experts and was asked to pull the bullet to see if I’ve over crimped the bullets. Jacketed bullets have a harder shell and are more resistant to crimping, while plated is a soft coating and very easy to dent. 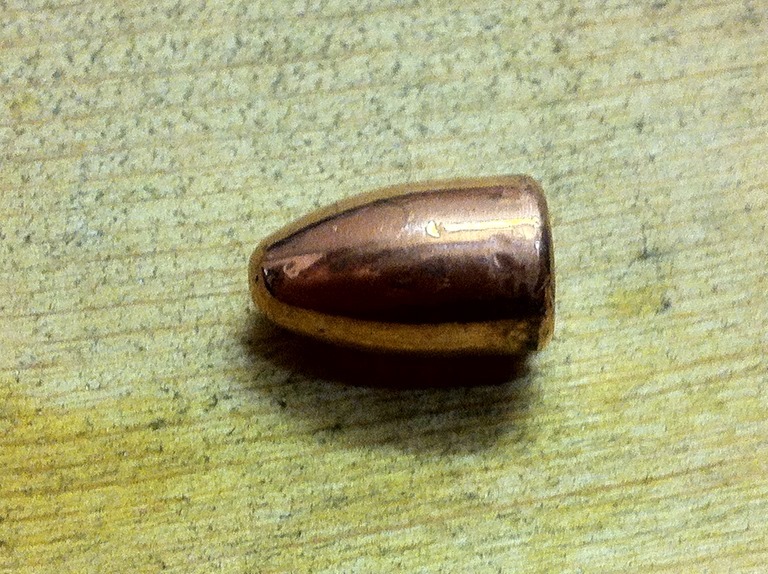 here’s how the bullet looks like after pulling it, as you can see, severe dent from over crimping. 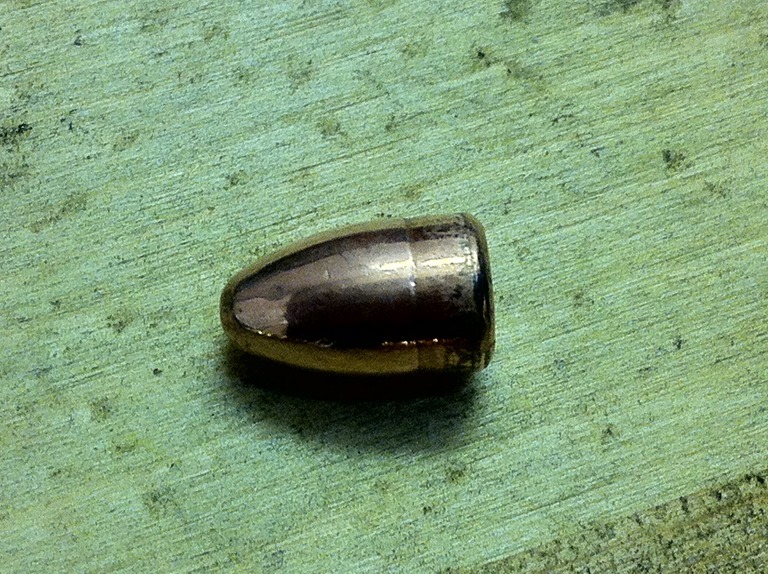 I readjusted my crimp die and now manage to crimp the bullet without marring the bullet. I’m now looking forward to testing this new batch of ammo to see if I can get as good a group as the Montana Gold jacketed bullets. I’ll be a happy camper if it works! I got a few PMs and emails requesting for information regarding reloading ammo for competition and have been wanting to make this video everytime I walk into my reloading room. Never got to do it but this time, I had a few hours to burn so brought my camera out and recorded everything I did. In this video I show you my lenghty process of reloading 38 Super Comp ammunition for my USPSA Open Division race gun. I have about 400 rounds of 115gr Montana Gold CMJs left so I thought I’d try the difference between a 124gr and 115gr. 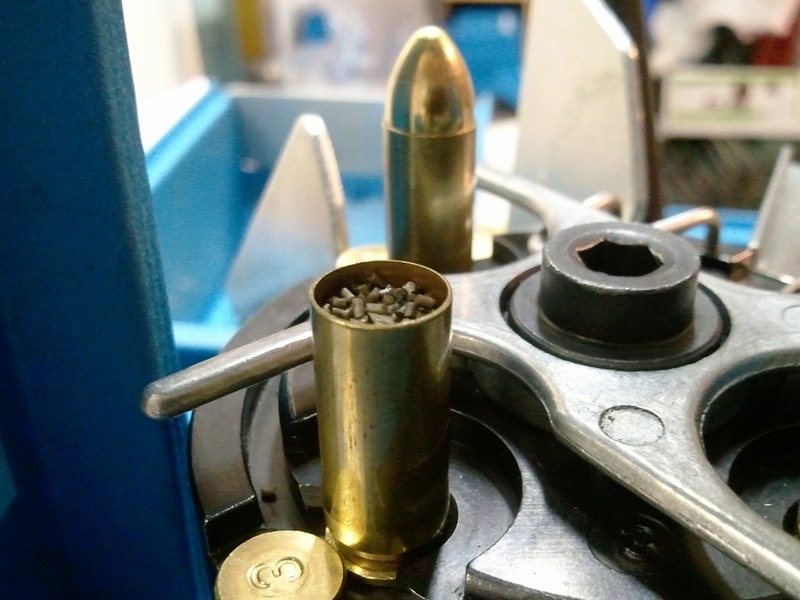 In order to make major factor using a 115gr bullet, I’d have to load in at least 11gr of Vihtavuori N105 powder. Since my open gun has a compensator, sometimes it is better to load it hotter at a higher Power Factor. The reason for doing so is to give the compensator a lot more gas to work on managing recoil. srsly! That’s so close to the top I had to carefully index the shellplate or risk vibrating or jolting the powder out of the case. In the past, I’ve been loading .45ACP and to make major power factor, all I had to use was 3.7grs of Hodgdon Clays. That’s barely visible inside the huge 45ACP case. Very different from reloading 38 Super Comp. The good thing about this is, I will never ever have a undercharge or overcharged case. That doesn’t mean that I can still be lazy, but it’s good to know that it’ll be safer. 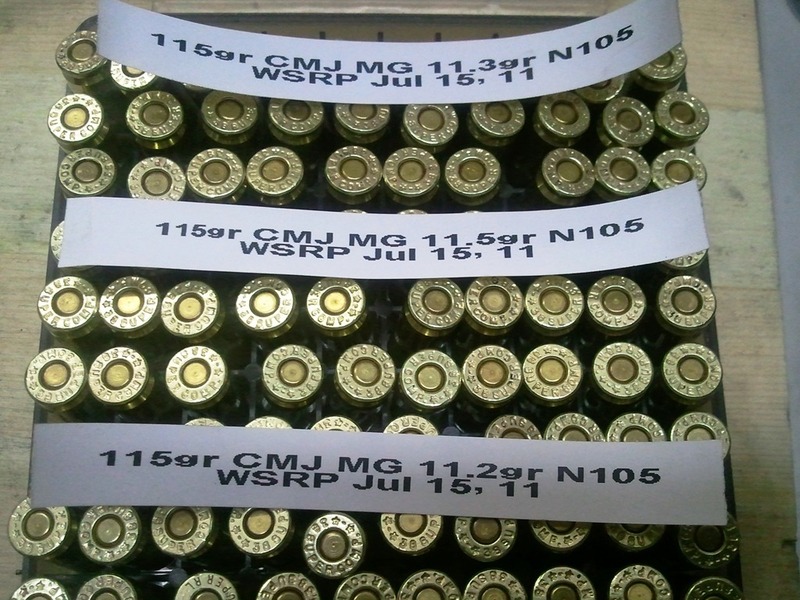 Here’s 90 rounds of 38 Super Comp I loaded today for Chrono. Now all I need is time to head to the range.